Potash is used to regulate the movement and storage of solutions throughout plants which can be compared to the blood system in animals or humans. This is a very wide ranging and vital role, affecting nutrient uptake, photosynthesis, rate of growth and feed value of forage. These functions require larger amounts of potash in total in the plant than any other nutrient including nitrogen. If adequate amounts are not present grass will not grow or yield as it should. There is also a particular relationship between nitrogen and potash. The large growth response of grass to nitrogen is dependent upon a balanced supply of potash both to assist N uptake by the roots as nitrate and to support the conversion of this to the complex proteins needed by animals. Total protein yield will be significantly reduced if potash is limiting. Potash is also very important in the microbiological fixation of nitrogen by root nodules in legumes. If clover is required to play a significant part in the sward, the supply of potash is of even greater importance. It is inefficient to allow soil reserves to fall to levels where grass growth is directly dependent upon fertiliser applications. 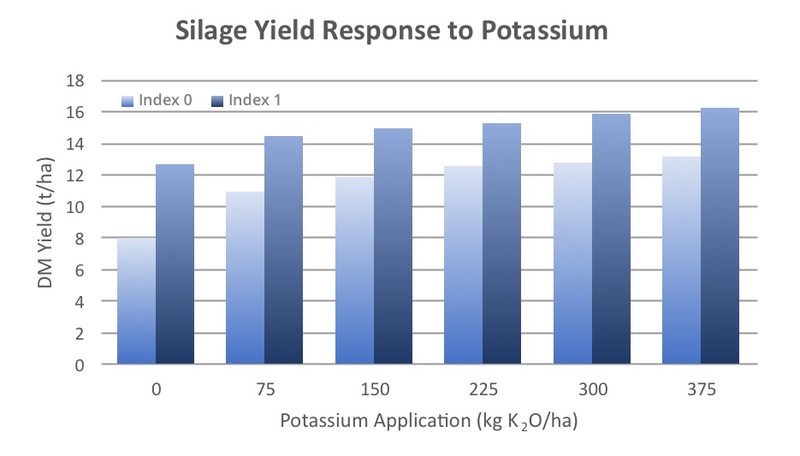 The graph below shows the impact of suboptimal K indices, with seasonal applications failing to achieve the yields obtained from high soil levels. The quantities of potash removed in silage are large and for multi-cut systems, which need replacing. The application of a correct balance of nitrogen, phosphate, potash and sulphur is essential to obtain the best yield of low-cost on-farm forage. In addition to their effect on yield, N and K fertilisers influence mineral content of grass, especially Mg, Na, and Ca which are required in lesser amounts for optimum growth. For animals however, the requirement is for more magnesium and sodium and only modest potassium. An adequate supply and balance of these minerals is important to minimise the risk of metabolic disorders such as hypomagnesaemia (staggers or grass tetany) and milk fever and to ensure fertility. Increasing uptake of one nutrient by the plant may affect the level of others, but it would be wrong to assume that the application of potash automatically leads to mineral disorders. The effect of potash fertiliser on herbage mineral content will vary widely in different situations.